When you are dealing with a water body the size of London’s Hyde Park, the presence of two or three dead fish may not seem significant, but it can be an important early warning that something is wrong. So when we received a call to our Incident Hotline (see below) about a small number of dead fish in the Norfolk & Suffolk Broads, we knew it could be serious. 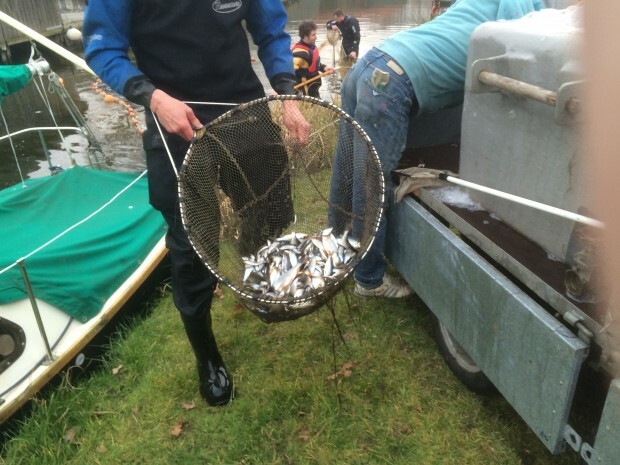 Ultimately it led to one of the largest fish rescues ever undertaken by the Environment Agency. I have worked for the Environment Agency for nearly 20 years, inspired by a love for the outdoors. As Fisheries Technical Specialist for Essex, Norfolk and Suffolk, my passion is looking after fish and working in partnership with our rod licence customers. Our area is one of the finest in the country for coarse fishing, so when you deal with an incident like this, it reinforces just how important your job is. 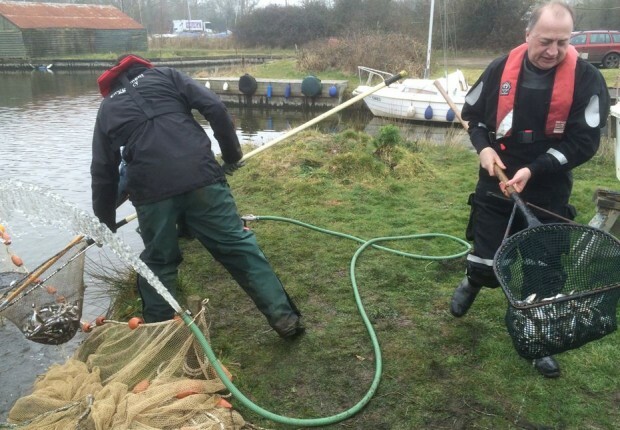 Over two incidents in March and April 2015, our teams saved more than 700,000 fish in the River Thurne which were trying to escape a bloom of Prymnesium algae. In both incidents, we received reports of a small number of dead fish and went to the site to investigate. We found hundreds of thousands of fish had become trapped at the far end of dykes with no means of escape. With so many fish packed into such a small area, they were in danger of seriously depleting the dissolved oxygen levels in the water. The fish were so desperate to escape they were even seen trying to climb over each other to get out of the water. They needed to be relocated quickly to have the best chance of survival. Aided by angling volunteers and boatyard owners, we were able to net the fish and move them in tanks to safer parts of the river. It is very difficult when we have to move fish in these circumstances because we know it can cause them more stress. We will only do it when we have no other choice. As well as netting the fish, we also worked with local farmers and the Internal Drainage Board to activate a pump and introduce fresh water to the river. By using new high-tech equipment we were able to reassess the numbers and distribution of fish and confirmed that the fresh water had helped save many thousands more fish. These events highlight the importance of our ongoing work in understanding and monitoring algae. We are hoping to continue to help colleagues from the John Innes Centre with their research into Prymnesium algae and its impacts on fish and other aquatic wildlife. I am proud of everyone who took part in the operation as it was a real team effort. We worked very long days, including weekends, to carry out the rescues and monitor the situation. We always want to make sure we do the best job we can – not just for the fish but for the anglers who pay for their rod licences and support our fisheries work.